Hey Ladies! My second Revlon review in two days, can you tell I'm a fan? ;) I bought this product a couple of months ago after running out of my beloved Blink & Go mascara and have only recently come to the end of the tube. I had a voucher to get a free product from Revlon so I decided that since I needed one, I would buy a new mascara. I had never tried a Revlon mascara before but the packaging and name of this product really appealed to me. I love the green and silver exterior and the brush looked big and fluffy which is what I look for as I find they create more volume. If you follow me on Instagram (@kayleighjcouture), you will know that I recently got semi-permanent eyelash extensions and although I loved them at first, they began to really irritate my eyes and in the end I hated them. With this being said, I would sit and pick at my lashes in the hope the false ones would come off. BAD MOVE Kayleigh, bad move. I ended up pulling half of my natural eyelashes out and was left with bald patches (see 'before' picture). I was absolutely gutted I hadn't just waited to get them taken off professionally but I can't even begin to tell you how much they were irritating my eyes. The glue felt clumpy, the lashes were pointing in five thousand different directions and I hated the fact I couldn't wear mascara. I really like the look of mascara on lashes as it opens and defines the eyes so the fact I couldn't wear it bugged me. Anyway, lesson learnt and I shall not be getting lash extensions ever again. Anyway, as my lashes were looking far from attractive I needed a mascara that really lengthened and separated the lashes I did have left. This is when I realised how amazing this mascara is. 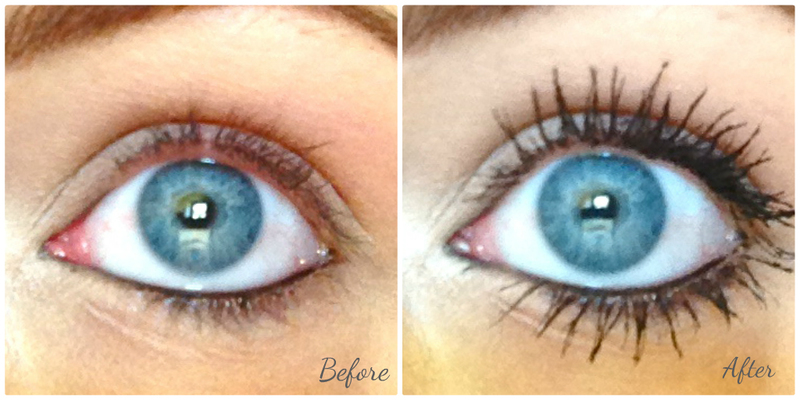 As you can see from the before and after photos above, my lashes were totally transformed after applying this product. The brush is the perfect size to cover all of my lashes, they instantly looked thicker, longer and the bald patches seemed to dissapear. I was pretty amazed to see what a difference this made to my eyes and it certainly helped disguise my mangled lashes. I feel ten times more confident when wearing this on my eyes and it stays put all day. The shade I bought was 'Blackened Brown' but when I was buying it I thought I'd picked up the standard black. I wasn't too bothered though as this shade made my lashes look super dark. Thankfully, since I took the above pictures a couple of weeks ago, my lashes have almost grown back. However, as I have lost lashes when I was younger, I have noticed they have grown much quicker whilst using this mascara. As it is called 'grow luscious', I am presuming there is an ingredients in there that helps stimulate growth? I have seen a visible improvement in my lashes whilst using this but that could just be my mind playing tricks on me. The only bad thing I would say about this mascara is that it is quite flaky and will crumble off the lashes pretty easily. However, this is something I am willing to deal with as my lashes look long, volumised and defined when wearing this mascara. If you don't like big brushes, thick mascara and lashes then this probably isn't for you but I officially love it. Nothing makes me feel better than huge glamorous eyelashes! Yey! P.S - Sorry for the bad quality before and after photos. It was too difficult to take a picture of my own eye with a huge SLR so these are from my Iphone. Apologies. Have you tried this mascara or any others from Revlon? What do you think of eyelash extensions? Your eyelashes look sooo good! :O Wow, i need this! This makes your eyelashes look really long and thick! The mascara looks amazing! You eyelashes look amazing, they look so much fuller and much longer! wow! Sounds like a great mascara! Really makes your lashes look super long! I have a friend who recently had the same experience with the lash extensions, loved them at first and then by the end she had lost a majority of her lashes - they are really sparse now, I'll send her your link though cause I bet she'll love to try out this mascara! this was just on sale at my cvs!! only if i knew it worked!!! Thank you so much for visiting my blog lovely, I am such a big fan of yours!